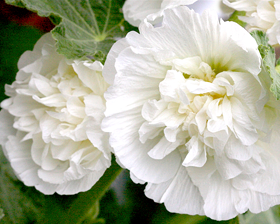 Spectacular, large, crystal white, fully double, powder-puff blooms grace tall strong stems from mid summer until autumn. Adds height and a touch of style to the back of perennial or cottage garden borders. Especially effective when planted in groups. Sow February to March or September to October. Sow seeds onto the surface of a good, free-draining, damp, seed compost. Cover with a very fine sprinkling of compost or vermiculite. Place in a propagator or seal container inside a polythene bag at a temperature of 15-20C until after germination which usually takes 14-21 days. Alternatively, sow in late summer in a cool greenhouse and then overwinter plants in cool, well lit conditions. Plant out the following spring. This method produces larger plants and is recommended if the soil is heavy or badly drained.